So, let’s see. I earned 30 credits toward a Master of Divinity at the School of Theology at Virginia Union University, completed the Evans-Smith Leadership Institute of STVUU and the Baptist General Convention of Virginia, served as a Communion Server for the Hampton University Minister’s Conference, President of the Pamunkey Baptist Association Sunday School and Literary Union, PBA Treasurer, First Vice-Moderator, and Moderator as well as Pastor of Trinity Baptist Church. And now, I am a church member with no office nor title. Attending a funeral at Trinity over the weekend, one of the deacons politely addressed me, “Hi John. How are you doing?” I have always told myself and others that a title is not important to me. But, I have to confess that I found it strange that this man had addressed me by my first name for the first time in about 20 years. I did not have a seat in a pulpit that I was welcomed in by my predecessor. This was a weird feeling. Had I remained where I was, I suppose I could have risen higher. I was a friend to some movers and shakers in the denomination. Finishing my degree and putting my name out there would have gone a long way. Or, perhaps I could have gone non-denominational and sought the position of evangelist, prophet, or conference teacher as a part of some modern “Five-Fold Ministry” movement. Making the right connections would put me on a fast track to greater notoriety. Even then, I could still keep my credentials as a Protestant clergyman. There is no fast track to rising in the ranks of Orthodoxy. Attending seminary is not to be considered or recommended to the bishop until after at least five years in the church in good standing. Even after earning an M.Div, there is no guarantee of becoming a priest immediately as the bishop (through prayer and the needs of the church) decides where to assign graduates and when, or if to ordain a seminary graduate into the priesthood. Skipping from one jurisdiction to the other in the hopes of being ordained is not permitted except by the bishops involved in such a change. As for leaving the church and starting a new Orthodox parish, whatever one would call such a church, it would not be recognized as Orthodox. 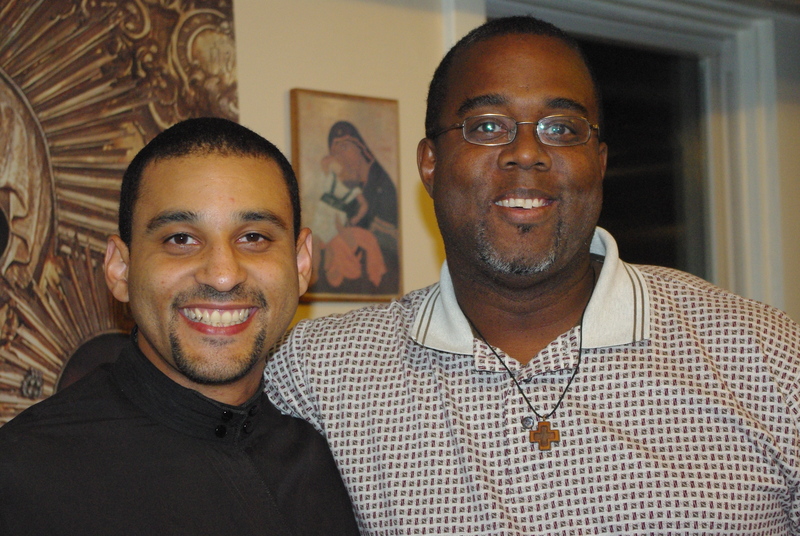 Hanging with Subdeacon Paul Abernathy. He is the Director of FOCUS Pittsburgh and a rising voice in the Orthodox Church. I am reminded about the value of humility. Jesus taught us not to be the one at the wedding feast trying to get the important seat because someone more important than you might show up. Instead, take the lowest seat in the house and there is a chance that someone will bring you up higher (Luke 14:7-11). Exchanging my comfort and privilege in the high seat of the Baptist Pastorate to be just another Orthodox Christian in the congregation does not take away from who I am. If anything, starting over can be a breath of fresh air in my spiritual journey. I can re-learn what ministry and my calling is all about. I am free to explore where God may have me to serve rather what others expect of me. Thus far, I am a bit of a reporter and blogger as I strive to organize the VA Chapter of the Brotherhood of St. Moses the Black. Fr. James has asked me to be a part of the evangelism team. And I have been asked to consider teaching a Sunday School lesson. I doubt if my name will be mentioned alongside the well-know voices on AFR or OCN. But, there is a place for me here in the Orthodox Church. All I have to do is prepare for whatever God has for me to do and do well with where I am assigned. In the mean time, this “lowest seat” is a good thing. I am worshiping with good brothers and sisters in the faith. I’m willing to bet it’s all for a good reason. May God continue to bless you and yours in Truth and Love. Amen, Brother John! I know exactly what you’re feeling because I felt the same way. I’m currently being considered by my priest to be the leader of our missions and evangelism ministry at our parish. I’m currently the vice president of the Southern California Chapter of the Brotherhood of Moses the Black, where my friend and Brother Turbo Qualls is the president. I truthfully am very happy NOT to be a part of clergy, and Lord willing have no aspirations of being a part of the clergy and thankfully for the sake of my soul, disqualified forever from being considered because I am the worst of the unworthy! I don’t miss it. And in time, you will too. I mean in a short time, you won’t miss what we’ve left behind! You’re in my prayers always!